Aerial photo of The Spokane Sun God during it's historic flight. Nearly blind in the velvet blackness of night, the pilot aims upward at the glow of exhaust. At 85 miles an hour, he feathers the airplane’s throttle and pulls to within a few dozen feet of the supply plane above. Out of the blackness, a hose appears. Avoiding hitting its flailing nozzle, Nick Mamer eases his biplane closer, so his on-board fuel man can capture the hose and refill his tank with gasoline. In 1929, this dance with death is the only way to refuel—while flying. Nick Mamer is attempting a world record by flying from Spokane, Washington to San Francisco, to New York, and from New York back to Spokane—without landing. Abruptly, the propeller strikes the hose, slicing it. The severed section and liquid gas slams onto the fuel man. An explosive cloud of gas cloaks the planes. If ignited by a spark from the motors’ hot exhausts, both planes and men will roast. 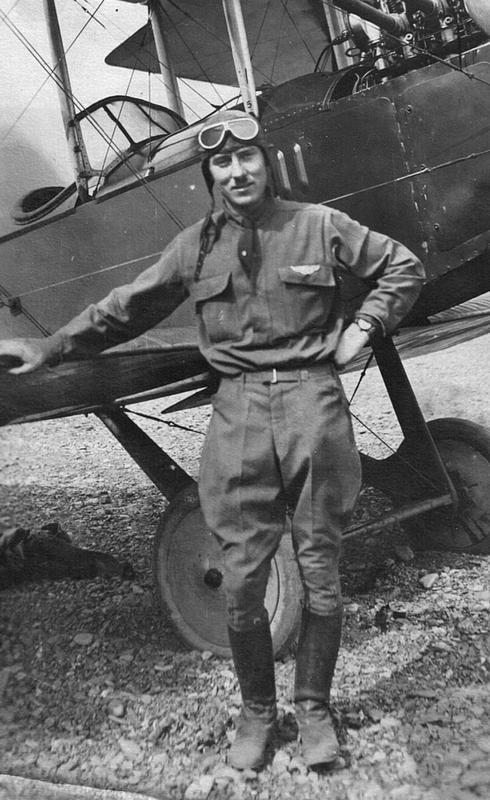 Low on Gas - High on Sky tells the true story of the flight of the Spokane Sun God, the Whirlwind-powered airplane from the Buhl Aircraft Co. 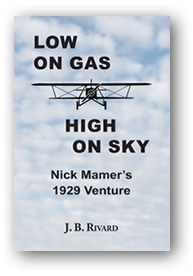 Author J.B. Rivard, the first to be given access to the archives of the Mamer family, relates the many exciting incidents of this 6,200-mile flight and the fascinating background of the man who led it. Map of Nick Mamer’s 1929 Transcontinental Flight. The 289-page soft-cover book is illustrated with vintage photographs from the Mamer family albums. It contains illustrations, a map, Notes and References, and a detailed Index; $19.95. It is available in the Spokane area at Auntie’s Bookstore in Spokane, the Heritage Museum in Spokane Valley, and in Western Aviation Pilot’s Shop at Felts Field. ORDERING: The book is stocked at Auntie’s. Phone 509-838-0206 or go to www.auntiesbooks.com. Orders are usually processed within 48-hours. USPS Media Mail-arrives 2-14 business days, $4.49 S+H. USPS Priority-arrives 1-3 days, $9.00 S+H. UPS Ground-arrives 2-7 days, $6.00 S+H. Digital and national-distribution print copies will become available later in 2019. 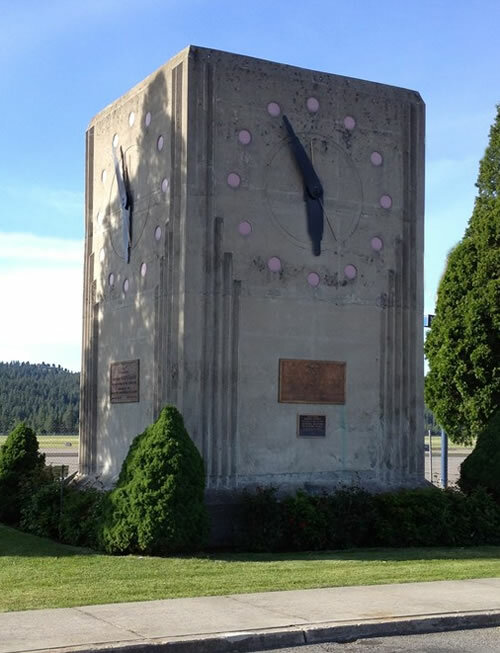 In 1939, after the death of Nick Mamer, the citizens of Spokane funded the construction of a memorial to him at Felts Field. It’s a 24-foot high poured-concrete structure near the administration building. The sides feature cast-bronze plaques and 9-foot clock faces (see photo). The plaques credit Lt. Nicholas B. Mamer with founding the Northwest Airway—the route over the Rocky Mountains from St. Paul, MN to Seattle, WA. Many unique aircraft, vintage and WWII, will be exhibited and/or flown at Felts Field on Neighbor Day, June 8, 2019. Please join us there near the Spokane Valley Museum exhibit. We’re looking forward to wonderful conversations with visitors on everything “aviation.” We will also be offering and signing copies of Low on Gas – High on Sky.